Tanzania offers some of east Africa's very number of idyllic, intimate beach with great style, atmosphere and fine coral sands, both on the mainland and on the islands just off the coast – including Mafia and Pemba. palm-fringed elegance are order of the day on the charismatic swahili islands and the best mainland coastal retreats. These beach holidays vary from relatively inexpensive through to very high quality. This glorious Swahili coastline can cater to every whim. Action or relaxation, air conditioning or a sea breeze, international buffets or a barbecue on the beach – all styles of accommodation exist here. From Zanzibar's biggest resorts to the smallest mainland hideaways, all are imbued with an easy going, laid-back attitude, no doubt aided by the calm, clear water that provides a backdrop to each of them. There is excellent diving and snorkeling on the reefs around Zanzibar, Pemba and Mafia, big game fishing is offered from some beach locations and many also have sailing boats, kayaks and kite-surfing. This variety of activities is an important point of discussion at the time of booking. You want the lodge that best matches your tastes! Zanzibar is the world's most famous paradise Islands. Ninety percent of Tanzania's beach accommodation is found here, just a twenty minute flight east of Dar es Salaam, a forty minute flight from Selous and now, thanks to a new fast service from Coastal Aviation, just two hours from the Serengeti. Zanzibar is blessed with miles and miles of white sand beach, protected by the coral reef that rings the majority of the island. There are secluded coves; working beaches where the dhow fisherman leave their boats; private stretches of untouched sand and, equally, stretches of sand with sun-beds as far as the eye can see. It is an island with something for everyone. There is very little beach on the western side of the island save the far north and south. The first major resort or lodge as you move anti-clockwise around coast from Stone Town is the Residence, found on the western side of Zanzibar's southerly tip. The beaches here tend to take the form of small coves flanked by rocky cliffs. They are fine but there are better beaches elsewhere. Rounding the south of the island brings you the bottom half of the east coast. Here an almost uninterrupted beach stretches all the way to the Michamvi peninsula. Some parts are better than others but in places it is one of the island's best. There are many good lodges here including some of our favourites to the north. The central village of Paje has become a world centre for kite surfing. Crossing Chwaka Bay leads us to the upper half of the eastern coast, dominated by the beaches of Kiwengwa and Matemwe. Kiwengwa is the domain of some of the islands largest resorts and generally best avoided but Matemwe is a great stretch of sand with several high quality boutique lodges to choose from. At the northern tip of Zanzibar, generally regarded as the prettiest part of the island, lies the village of Nungwi. This once sleepy fishing village is now a travel hotspot, with some great lodges on the eastern side and a backpacker's area on the western side. Moving south and west takes us to the final beach area of Kendwa, home to Zanzibar's finest beach but, unfortunately, some of its worst resorts. Kilindi hidden round the headland from this area, is the wonderful exception. The long beaches of Tanzania's mainland are not frequently visited when compared to the sister islands of Mafia, Pemba and Zanzibar just off the coast. Reasons for this might that it is relatively unknown and the long time to travel by road from Tanzania's northern national parks and the game reserves in the south. Slowly but surely, the northern Swahili coast with its palm-fringed beaches are developing; Bagamoyo and Pangani especially being the main attractions. What to do on the Tanzanian coast (Main Land)? 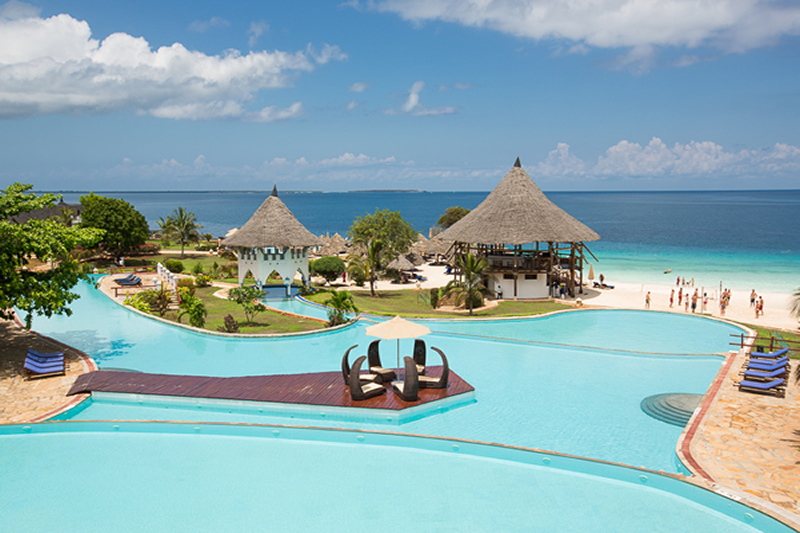 The coast south of Dar es salaam also has some luxurious resorts and a few smaller hotels. These lay directly on the warm Indian Ocean, perfect for resting away from the maddening crowds. The island of Pemba, also known as 'Al Jazeera Al Khaddar' (the green island – in Arabic), is an island forming part of the Zanzibar archipelago, lying off the east coast of Africa in the Indian Ocean. It is situated about 50 kilometers to the north of the Unguja (the island proper of Zanzibar). In 1964 Zanzibar was united with the former colony of Tanganyika to form Tanzania. Pemba lies 50 kilometers east of mainland Tanzania. 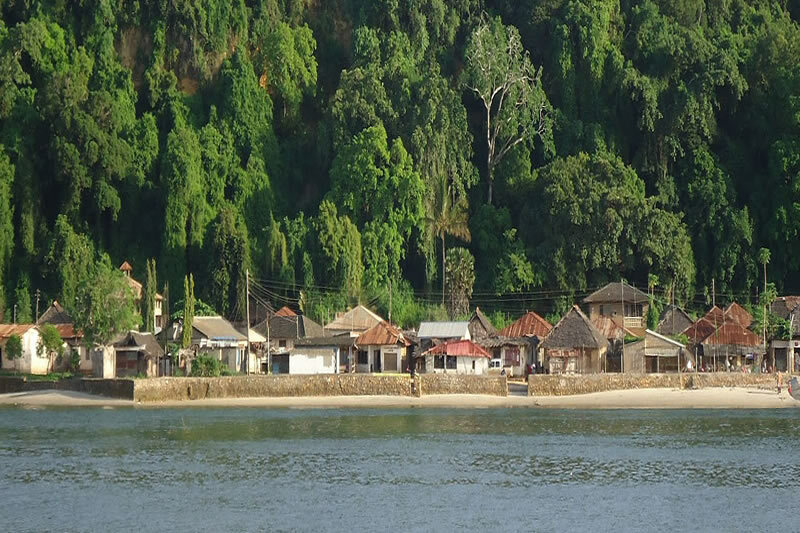 The most important towns in Pemba are ChakeChake (the capital), Mkoani, and Wete, being the largest city. The centrally located Chake-Chake is perched on a hill with a view to the west on a bay and the tiny Misali island where the tides determine when a dhow can enter the local harbour. Pemba is, with the exception of a strip of land along its east coast, a very fertile place: beside clove trees, the locals grow mainly rice, coconut, bananas¸ cassava and red beans called maharagwe in Swahili. Together with Mafia Island (south of Zanzibar), these three islands form the Spice Islands (not to be confused with the Maluku Islands of Indonesia). In 1988, the estimated population was 265,000, with an area of 980 km². Most of the island, which is hillier and more fertile than Zanzibar, is dominated by small scale farming. There is large scale farming of cash crops such as cloves — there are over 3 million clove trees on the island. There is a quite large Arab community on the island who emigrated from Oman. The population is a mix of Arab and original Waswahili inhabitants of the island. A significant portion of the population also identifies itself as Shiraz people. Pemba is also becoming well-known for its dive sites, with steep drop-offs, untouched coral and a very abundant marine life. 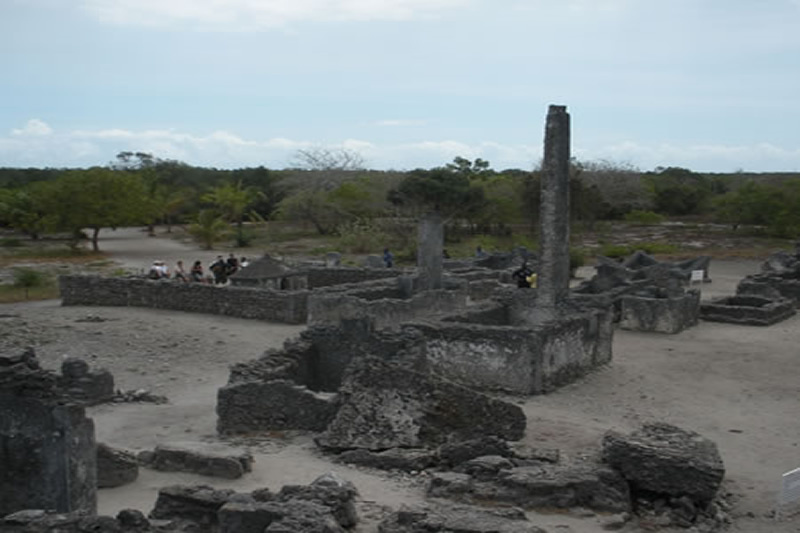 Also well worth visiting are the Pujini Ruins situated south-east of Chake Chake, Pemba's largest town. These overgrown ruins are the remains of a 13th century Swahili town ruled by a despotic king. Opposite the Pujini Ruins you will find the well-preserved ruins of Ras Mkumbuu, which are located at the tip of the long peninsula. Don't miss out on Pemba's natural wonders, such as the Ngezi Forest in the north, a protected rain forest which is home to an endemic species of bats, known as the Pemba flying fox. Another gem just off the western shore of Pemba is Misali Island. Together with its surrounding reef it has been incorporated into the Misali Island Conservation Area and is world-famous for its beautiful corals and beaches. Furthermore, the conservation area is a breeding site for green and hawks bill turtles.